Symon Vasylyovych Petliura[lower-alpha 1] (Ukrainian: Си́мон Васи́льович Петлю́ра, Russian: Симо́н Васи́льевич Петлю́ра; May 22, 1879 – May 25, 1926) was a publicist, writer, journalist, Ukrainian politician, statesman of the Ukrainian People's Republic, and nationalist leader who led Ukraine's struggle for independence following the Russian Revolution of 1917 (1918–1921). Petliura has been a controversial figure connected with pogroms of Jews in the Russian Empire. On May 25, 1926 he was killed in the center of Paris by the Russian anarchist of Jewish origin Sholom Schwartzbard. Petliura was born on May 22 (Gregorian calendar, 10 May on Julian calendar), 1879, in a suburb of Poltava, Ukraine, the son of Vasyl Pavlovych Petliura and Olha Oleksiyivna (née Marchenko), of Cossack class. His father Vasyl Pavlovych was the Poltava city resident and had own transportation business. Petliura's mother was a daughter of hieromonk. Petliura's initial education was obtained in parochial schools, and he planned to become an Orthodox priest. During his years 1895 - 1901 in the Russian Orthodox Seminary in Poltava, Petliura joined the Hromada society in 1898. When his membership in Hromada was discovered in 1901, he was expelled from the seminary. In 1900 Petliura joined the Revolutionary Ukrainian Party. In 1902, under threat of arrest, he moved to Yekaterinodar in the Kuban where he worked for 2 years initially as a schoolteacher and later in the archives of the Kuban Cossack Host where he helped organize over 200 thousand documents. In December 1903, he was arrested for organizing a RUP branch in Yekaterinodar and for publishing inflammatory anti-tsarist articles in the Ukrainian press outside of Imperial Russia (in Lviv). He was released on bail in March 1904, moving briefly to Kiev and then emigrating to the Western Ukrainian city of Lviv then in the Austro-Hungarian Empire. In Lviv, Petliura lived under the name of Sviatoslav Tagon working alongside Ivan Franko, Volodymyr Hnatiuk publishing and working as an editor for the "Literaturno-Naukovy Zbirnyk" Journal (Literary-Scientific Collection), the Shevchenko Scientific Society and as a co-editor of "Volya" magazine. He contributed numerous articles to the Ukrainian language press in Galicia. At the end of 1905, after amnesty was declared, Petliura returned briefly to Kiev but soon moved to the Russian capital of Petersburg in order to publish the socialist-democratic monthly magazine Vil’na Ukrayina (Free Ukraine) along with Prokip Poniatenko and Mykola Porsh. After Russian censors closed this magazine in July 1905, he moved back to Kiev where he worked for the magazine Rada (Council). In 1907–09 he became the editor of the literary magazine Slovo (Word) and co-editor of Ukrayina (Ukraine). Because of the closure of these publications by the Russian Imperial authorities, Petliura was forced to once again move from Kiev to Moscow in 1909, where he worked briefly as an accountant. There, he married Olha Bilska (1885–1959), with whom he had a daughter, Lesia (1911–42). From 1912 he was a co-editor of the influential Russian-language journal Ukrainskaya zhizn’ (Ukrainian life) until May 1917. As the editor of numerous journals and newspapers, Petliura published over 15 000 critical articles, reviews, stories and poems under an estimated 120 nom-de-plumes. His prolific work in both the Russian and Ukrainian languages helped shape the mindset of the Ukrainian population in the years leading up to the Revolution in both Eastern and Western Ukraine. His prolific correspondence was of great benefit when the Revolution broke out in 1917, as he had contacts throughout Ukraine. As the Ukrainian language had been outlawed in the Russian Empire by the Ems Ukaz of 1876, Petliura found more freedom to publish Ukraine oriented articles in Saint Petersburg than in Ukraine. There, he published the magazine "Vil'na Ukrayina" (Independent Ukraine, Ukrainian: Вільна Україна) until July 1905. Tsarist censors, however, closed this magazine, and Petliura moved back to Kiev. In Kiev, Petliura first worked for "Rada" (Council: Ukrainian – Радa). In 1907 he became editor of the literary magazine "Slovo" (The Word: Ukrainian – Слово). Also, he co-edited the magazine "Ukrayina" (Ukraine, Ukrainian: Україна). In 1909, these publications were closed by Russian imperial police, and Petliura moved back to Moscow to publish. There, he was co-editor of the Russian language magazine "Ukrayinskaya Zhizn" (Ukrainian Life) to familiarize the local population with news and culture of what was known as Malorossia. He was chief editor with this publication from 1912 to 1914. In Moscow he married his wife Olha Bilska in 1915 (later she was also known as her husband under the surname of Marchenko). There, in Moscow was born the daughter of Petliura, Lesia (Olesia). In Paris, Petliura continued the struggle for Ukrainian independence as a publicist. In 1924, Petliura became the editor and publisher of the weekly journal "Tryzub" (Trident or Ukrainian: Тризуб). He contributed to this journal using various pen names, including V. Marchenko, and V. Salevsky. Petliura's correspondence with all the noted Ukrainian literary figures of the time and his many articles addressing the problems of Ukrainian self-awareness and cultural development were unavailable during the Soviet period and have only recently been made available for study. Previously all the journals which he published and edited were only available in main Academic library in Moscow, in the vaults with restricted access. Currently scholarship in Petliura's monumental legacy is being collected, published and carefully studied. New documents continue to be discovered. Petliura as a delegate attended the First All-Ukrainian Congress of Soldier Deputies held in Kiev in May 1917, when on May 18 he was elected head of the Ukrainian General Military Committee, the progenitor of the Ukrainian modern ministry of defense. With the proclamation of the Central Council of Ukraine on June 28, 1917, Petliura became the first Secretary (Minister) for Military Affairs. Disagreeing with the politics of the then chairman of the General Secretariat Volodymyr Vynnychenko, Petliura left the government and became the head of the Haydamaka Kish of Sloboda Ukraine (in Kharkiv), a military formation that in January–February 1918 was forced back to protect Kiev during the Uprising on the Arsenal Plant and prevent capturing the capital by the Bolshevik Red Guard. After the Hetmanate Putsch (April 28, 1918), Petliura was arrested by the Skoropadsky administration and spent four months incarcerated in Bila Tserkva. After his release, Petliura participated in the anti-Hetmanate putsch and became a member of the Directorate of Ukraine as the Chief of Military Forces. With the fall of Kiev and the emigration of Vynnychenko from Ukraine, Petliura became the leader of the Directorate in February 1919. In his capacity as head of the Army and State, he continued to fight both Bolshevik and White forces in Ukraine for the next ten months. With the outbreak of hostilities between Ukraine and Soviet Russia in January 1919, and with Vynnychenko's emigration, Petliura ultimately became the leading figure in the Directorate. During the winter of 1919 the Petliura army lost most of Ukraine (including Kiev) to Bolsheviks and by March 6 relocated to Podolia. In the spring of 1919 he managed to extinguish a coup-d'etat led by Volodymyr Oskilko who saw Petliura cooperating with socialists such as Borys Martos. During the course of the year, Petliura continued to defend the fledgling republic against incursions by the Bolsheviks, Anton Denikin's White Russians, and the Romanian-Polish troops. By autumn of 1919, most of Denikin's White Russian forces were defeated — in the meantime, however, the Bolsheviks had grown to become the dominant force in Ukraine. Petliura withdrew to Poland December 5, 1919, which had previously recognized him as the head of the legal government of Ukraine. In April 1920, as head of the Ukrainian People's Republic, he signed an alliance in Warsaw with the Polish government, agreeing to a border on the River Zbruch and recognizing Poland's right to Galicia in exchange for military aid in overthrowing the Bolshevik regime. Polish forces, reinforced by Petliura's remaining troops (some two divisions), attacked Kiev on May 7, 1920 in what became a turning point of the 1919–21 Polish-Bolshevik war. Following initial successes, Piłsudski's and Petliura's forces were pushed back to the Vistula River and the Polish capital, Warsaw. The Polish Army defeated the Bolshevik Russians, but Ukrainians were unable to secure independence. Petliura directed the affairs of the Ukrainian government-in-exile from Tarnów and when the Soviet Union requested Petliura's extradition from Poland, the Poles engineered his "disappearance," secretly moving him from Tarnów to Warsaw. Bolshevik Russia persistently demanded that Petliura be handed over. Protected by several Polish friends and colleagues, such as Henryk Józewski, with the establishment of the Soviet Union on December 30, 1922, Petliura, in late 1923 left Poland for Budapest, then Vienna, Geneva and finally settled in Paris in early 1924. Here he established and edited the Ukrainian language newspaper Tryzub (Trident). During his time as leader of the Directorate, Petliura was active in supporting Ukrainian culture both in Ukraine and abroad. Petliura introduced the awarding of the title "People's Artist of Ukraine" to artists who had made significant contributions to Ukrainian culture. A similar title award was continued after a significant break under the Soviet regime. Among those who had received this award was blind kobza player Ivan Kuchuhura Kucherenko. He also saw the value in gaining international support and recognition of Ukrainian arts through cultural exchanges. Most notably, Petliura actively supported the work of cultural leaders such as the choreographer Vasyl Avramenko, conductor Oleksander Koshetz and bandurist Vasyl Yemetz, to allow them to travel internationally and promote an awareness of Ukrainian culture. Koshetz created the Ukrainian Republic Capella and took it on tour internationally, giving concerts in Europe and the Americas. One of the concerts by the Capella inspired George Gershwin to write "Summertime", based on the lullaby Oi Khodyt Son Kolo Vikon (The dream passes by the Windows) All three musicians later emigrated to the United States. In Paris, Petliura directed the activities of the government of the Ukrainian National Republic in exile. He launched the weekly Tryzub, and continued to edit and write numerous articles under various pen names with an emphasis on questions dealing with national oppression in Ukraine. These articles were written with a literary flair. The question of national awareness was often of significance in his literary work. Petliura's articles had a significant impact on the shaping of Ukrainian national awareness in the early 20th century. He published articles and brochures under a variety of noms de plume, including V. Marchenko, V. Salevsky, I. Rokytsky, and O. Riastr. Anti-Jewish pogroms accompanied the Revolution of 1917 and the ensuing Russian Civil War. The Ukrainian state promised Jews full equality and autonomy, and Arnold Margolin, a Jewish minister in Petliura's government, declared in May 1919 that the Ukrainian government had given Jews more rights than they enjoyed in any other European government. However, Petliura lost control over most of his armed forces, who then engaged in killing Jews. During Petliura's term as Head of State (1919–20), pogroms continued to be perpetrated on Ukrainian ethnic territory, and the number of Jews killed during the period is estimated to be from 35,000 to 50,000. Petliura's role in the pogroms has been a topic of dispute since his assassination and Schwartzbard's trial. In 1969, the Journal of Jewish Studies published two opposing views by scholars Taras Hunczak and Zosa Szajkowski, which are still frequently cited. Later the Journal published letters of the two authors. Some historians claim that Petliura, as the head of the government, did not do enough to stop the pogroms. They suggest this lack of activity knowingly encouraged them, thus strengthening his base of support among his soldiers, commanders and the peasant population at large, by appealing to antisemitic sentiments. They also suggest that many of the atrocities were committed by the forces directly under the command of the Directorate and loyal to Petliura. According to a Jewish former member of the Ukrainian government's cabinet, Solomon Goldelman, Petliura was afraid to punish officers or soldiers engaged in crimes against Jews for fear of losing their support. Nevertheless, Goldelman consistently defended Petliura and his record. Petliura is said to have once said, "it is a pity that pogroms take place, but they uphold the discipline of the army." It should not go anywhere away from us; it has been living with us since time immemorial, sharing our fate and misfortune with us. Historians have pointed out that Petliura himself never demonstrated any personal antisemitism, and it is documented that he actively sought to halt anti-Jewish violence on numerous occasions, introducing capital punishment for the crime of pogroming. Taras Hunczak of Rutgers University writes that "to convict Petliura for the tragedy that befell Ukrainian Jewry is to condemn an innocent man and to distort the record of Ukrainian-Jewish relations". Because the Soviet Union saw Petliura and Ukrainian nationalism as a threat, it was in its interest to tarnish his reputation. A propaganda campaign to this end included accusations of anti-Jewish crimes. Hunczak insists that "Petliura's own personal convictions render such responsibility highly unlikely, and all the documentary evidence indicates that he consistently made efforts to stem pogrom activity by UNR troops." 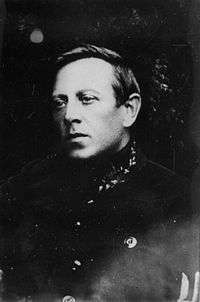 In 1921 Ze'ev Jabotinsky, the father of Revisionist Zionism, signed an agreement with Maxim Slavinsky, Petliura's representative in Prague, regarding the formation of a Jewish gendarmerie which was to accompany Petliura’s putative invasion of Ukraine, and would protect the Jewish population from pogroms. This agreement did not materialize, and Jabotinsky was heavily criticized by most Zionist groups. Nevertheless, he stood by the agreement and was proud of it. "When the policeman told me Petliura was dead I could not hide my Joy. I leaped forward and threw my arms about his neck." Schwartzbard claimed that he was walking around Paris with Petliura's photo in one pocket and his handgun in another, peering in the faces of the Paris residents just to find his victim. Schwartzbard was an anarchist of Jewish descent, born in the Ukraine. He participated in the Jewish self-defense of on the Balta in 1905. The Russian Tsarist government sentenced him to 3 months in prison for "provoking" the Balta pogrom. He was twice convicted of taking part in anarchist "expropriation" (burglary) and bank robbery in Austria-Hungary. He later joined the French Foreign Legion (1914–1917) and was wounded in the Battle of the Somme. It is reported that Schwartzbard told famous fellow anarchist leader Nestor Makhno in Paris that he was terminally ill and expected to die and that he would take Petliura with him; Makhno forbade Schwartzbard to do so. 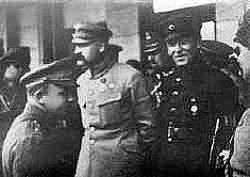 The French Secret service had been keeping an eye out on Schwartzbard from the time he had surfaced in the French capital and had noted his meetings with known Bolsheviks. During the trial the German special services also informed their French counterparts that Schwartzbard had assassinated Petliura on the orders of Galip, an emissary of the Union of Ukrainian Citizens. He had received orders from a former chairman of the Soviet Ukrainian government and current Soviet Ambassador to France, Christian Rakovsky, an ethnic Bulgarian and a revolutionary leader from Romania. The act was consolidated by Mikhail Volodin, who arrived in France August 8, 1925 and who had been in close contact with Schwartzbard. Both sides brought on many witnesses, including several historians. A notable witness for the defense was Khaye Greenberg (aged 29), a local nurse who survived the Proskurov pogroms and testified about the carnage. She never said that Petliura personally participated in the event, but rather some other soldiers who did said that they were directed by Petliura. The pogrom in Proskurov had actually taken place on the initiative and under the leadership of Otaman Semesenko on February 15, 1919 (soon after the fall of the Hetmanate). Two weeks later Petliura's orders denouncing the event were published in newspapers. 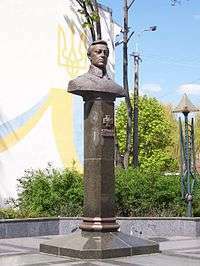 Because of a difficult situation the execution of Semesenko was postponed until November 1920. Several former Ukrainian officers testified for the prosecution. After a trial lasting eight days the jury acquitted Schwarzbard. Petliura is buried alongside his wife and daughter in the Cimetière du Montparnasse in Paris, France. Petliura's two sisters, Orthodox nuns who had remained in Poltava, were arrested and shot in 1928 by the NKVD (the Soviet secret police). It is claimed that in March 1926 Vlas Chubar (Chairman of the Council of People's Commissars of the Ukraine), in a speech given in Kharkiv and repeated in Moscow, warned of the danger Petliura represented to Soviet power. It is after this speech that the command was allegedly given to assassinate Petliura. In current Ukraine political parties such as the Ukrainian People's Party consider Schwartzbard a Soviet spy (NKVD). That the assassination of Petliura was a special operation of the GPU was acknowledged by a defected KGB operative and World War II veteran Peter Deriabin during a speech to the US Congress. With the dissolution of the Soviet Union in 1991, previously restricted Soviet archives have allowed numerous politicians and historians to review Petliura's role in Ukrainian history. Some consider him a national hero who strove for the independence of Ukraine. Several cities, including Kiev, the Ukrainian capital and Poltava, the city of his birth, have erected monuments to Petliura, with a museum complex also being planned in Poltava. To mark the 80th anniversary of his assassination, a twelve-volume edition of his writings, including articles, letters and historic documents, has been published in Kiev by the Taras Shevchenko University and the State Archive of Ukraine. In 1992 in Poltava a series of readings known as "Petlurivski chytannia" have become an annual event, and since 1993 these take place annually at Kiev University. In June 2009 the Kiev city council renamed Komintern's Street (located in the Shevchenkivskyi Raion) into Symon Petliura Street to commemorate the occasion of his 130th birthday anniversary. In current Ukraine Petliura has not been as much lionized as Mykhailo Hrushevsky (who played a much smaller role in the Ukrainian People's Republic) as Petliura was too much associated with violence to make a good symbolic figure. In a 2008 poll of "Famous Ukrainians of all times" (in which respondents did not receive any lists or tips) Petliura was not mentioned (Hrushevsky came in sixth place in this poll). In the 2008 TV project Velyki Ukraïntsi (Greatest Ukrainians) he placed 26th. A nephew of Symon Petliura, Stepan Skrypnyk became the Patriarch Mstyslav of the Ukrainian Orthodox Church on 6 June 1990. In Israel and the Jewish world Petliura is mostly remembered by some as the leader in charge of Ukraine when pogroms took place (Yad Vashem and the writing on the street sign honoring Schwartzbard in Beersheba). One of the Ukrainian Jewish leaders in independent Ukraine wrote that "Petliura did not want or was not able to defend Ukrainian Jews from his own army". Recently uncovered documents and letters to prominent Jewish community leaders demonstrate Petliura's support for the establishment of a Jewish state in Palestine. In a "in the name of" the Jewish population of Ukraine, former Jewish affairs minister Pinchas Krasny thanked Petliura for his support for the vote in the League of Nations of July 24, 1922 regarding the formation of a Jewish state in Palestine. A further reflection regarding Petliura's position regarding Jews is demonstrated by another interesting fact. In exile, as the Head Otаman of the Ukrainian forces, he was functioning in great material difficulties. In February 1921 he assigned Jewish refugees from Ukraine in Poland 15 thousand Polish Marks in aid. For part of the Western Ukrainian diaspora, Petliura is remembered as a national hero, a fighter for Ukrainian independence, a martyr, who inspired hundreds of thousands to fight for an independent Ukrainian state. He has inspired original music, and youth organizations . During the revolution Petliura became the subject of numerous folk songs, primarily as a hero calling for his people to unite against foreign oppression. His name became synonymous with the call for freedom. 15 songs were recorded by the ethnographer rev. prof. K. Danylevsky. In the songs Petliura is depicted as a soldier, in a manner similar to Robin Hood, mocking Skoropadsky and the Bolshevik Red Guard. News of Petliura’s assassination in the summer of 1926 was marked by numerous revolts in eastern Ukraine particularly in Boromlia, Zhehailivtsi, (Sumy province), Velyka Rublivka, Myloradov (Poltava province), Hnylsk, Bilsk, Kuzemyn and all along the Vorskla River from Okhtyrka to Poltava, Burynia, Nizhyn (Chernihiv province) and other cities. These revolts were brutally pacified by the Soviet administration. The blind kobzars Pavlo Hashchenko and Ivan Kuchuhura Kucherenko composed a duma (epic poem) in memory of Symon Petliura. 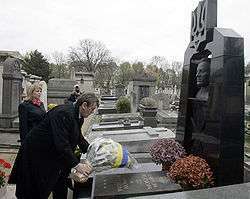 To date Petliura is the only modern Ukrainian politician to have a duma created and sung in his memory. This duma became popular among the kobzars of left-bank Ukraine and was sung also by Stepan Pasiuha, Petro Drevchenko, Bohushchenko, and Chumak. The Soviets also tried their hand at portraying Petliura through the arts in order to discredit the Ukrainian national leader. A number of humorous songs appeared in which Petliura is portrayed as a traveling beggar whose only territory is that which is under his train carriage. A number of plays such as the “Republic on wheels” by Mamontov and the opera “Shchors” by Boris Liatoshinsky and “Arsenal” by Georgy Maiboroda portray Petliura in a negative light, as a lackey who sold out Western Ukraine to Poland, often using the very same melodies which had become popular during the fight for Ukrainian Independence in 1918. Petliura continues to be portrayed by the Ukrainian people in its folk songs in a manner similar to Taras Shevchenko and Bohdan Khmelnytsky. He is likened to the sun which suddenly stopped shining. ↑ Symon Petliura is also known as Simon Petlura, Symon Petlura, or Symon Petlyura. ↑ Magocsi, Paul Robert. 2010. A History of Ukraine: The Land and Its Peoples. Toronto: University of Toronto Press, p. 538. ↑ Zamoyski, Adam. 2007. Warsaw 1920: Lenin's Failed Conquest of Europe. London: HarperPress, p. viii. ↑ Marples, David R. 2008. Heroes and Villains: Creating National History in Contemporary Ukraine. Budapest: Central European University Press, p. 57. 1 2 3 4 5 6 7 8 9 Hunczak, T. Petliura, Symon. Encyclopedia of Ukraine. ↑ Klymkiw, Walter. "Olexander Koshetz Ukraine's Great Choral Conductor." Forum 67, 1986: 15. ↑ See Friedman, Saul S. Pogromchik: The Assassination of Simon Petliura. New York : Hart Pub, 1976. ↑ Henry Abramson, Jewish Representation in the Independent Ukrainian Governments of 1917–1920, Slavic Review, Vol. 50(3), 1991, pp. 542–550. ↑ Symon Petliura. Against pogroms. The Appeal to Ukrainian Army. ↑ "FRANCE: Petlura Trial". TIME.com. November 7, 1927. Retrieved April 17, 2015. ↑ "РџР°СЂРєРѕРІР°СЏ СЃС‚СЂР°РЅРёС†Р° Imena.UA". Retrieved April 17, 2015. ↑ Saul S. Friedman, Pogromchik: The Assassination of Simon Petlura. New York : Hart Pub, 1976. ↑ "FRANCE: Petlura Trial". Time. November 7, 1927. Retrieved May 24, 2010. ↑ "Симон Петлюра". Retrieved April 17, 2015. ↑ Top 11-100, Velyki Ukraïntsi. Danylevskyi, K. Petliura v sertsiakh i pisniakh svoho narodu // Nakladom filii Tovarystva ukrayinskykh politychnykh v’iazniv v Regensburzi, 1947 – P. 11. Danylevskyi, K. О. Professor Petliura v sertsiakh i pisniakh svoho narodu // Vidbytka z Narodnoho Slova, Pittsburgh, USA, 1951 – P. 24. Sholom Schwartzbard: Over The Years (Inem Loif Fun Yoren). Excerpt from a book by Petliura's assassin explaining his actions. "Petlura, Simon". Collier's New Encyclopedia. 1921. "Unknown Symon Petliura: history of an interview," Zerkalo Nedeli (Mirror Weekly), July 7–13, 2001. Available online in Russian and in Ukrainian. "A Belated Idealist," Zerkalo Nedeli (Mirror Weekly), May 22–28, 2004. Available online in Russian and in Ukrainian. "Symon Petliura as opponent of Jewish pogroms," Zerkalo Nedeli (Mirror Weekly), July 25–31, 1996. Available online in Russian. Article published in the "Archives of the Ukrainian Security Service" on Petlura and the GPU re his assassination based on recently discovered materials from the vaults of the Ukrainian Security Service in Ukrainian. Petliura web site in Poltava Web site of documents pertaining to Symon Petliura in Ukrainian, Russian and English.